The road opener saw the Turkey Valley girls’ basketball team (3-2, 3-0 UIC) pick up a 51-36 victory over Central (3-2, 2-1 UIC) Tuesday night in Elkader. The Lady Trojans scored the first points of the night and built a 22-11 lead by midway through the second quarter. In the closing four minutes of the first half, Central outscored TV 12-3 to make it 25-23 in favor of the Trojans at the break. In the second half, Jalyssa Blazek and Lindsey Jackson worked hard to contain Central star guard Hannah Erickson’s shot, holding the Warriors to 13 second-half points to claim the win. Hitting double digits were Jordan Lukes with 12, including three treys to go with five rebounds and four steals. Breanna Busta posted 11 points and 11 boards, while Jaycie Byrne added 10 points and four steals in the road win. 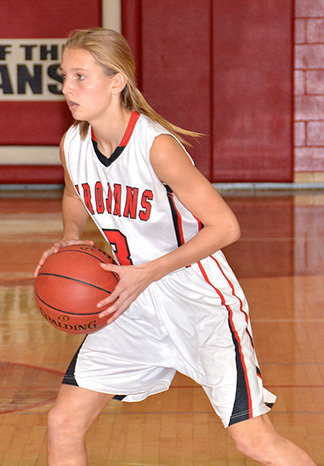 The Trojans are at home against MFL MarMac Friday, Dec. 7, and travel to Kee High Tuesday, Dec. 11. Both contests are set to begin at 6:15 p.m.